I just got off the phone with former Ubuntu chef Jeremy Fox, who was recom-mending new and soon-to-open restaurants in San Francisco for me (including Benu, the much-anticipated restaurant of former French Laundry chef Corey Lee, which is slated to open later this summer). The world learned last month that Jeremy was going to be the chef at Plum, an Oakland, Calif., restaurant Daniel Patterson (of Coi in San Francisco) had planned to open in July. Jeremy tells me Plum is now slated to open in the first week of September, serving plant-based cuisine, much of it from a garden on which he and Patterson will be breaking ground this summer (the picture above is from Jeremy’s days at Ubuntu, where he also had a garden). Plant-based doesn’t mean vegetarian. Jeremy said he will be making his own charcuterie for Plum, and that the restaurant’s dishes will have more animal ears and skin than loins and other muscle meat — for flavoring rather than to be featured in the center of the plate. But things will be hopping at that garden, which not only will be supplying produce for Plum, but also for Bracina, Patterson’s long-delayed restaurant in Oakland’s Jack London Square, which Jeremy says is now slated for a January opening. 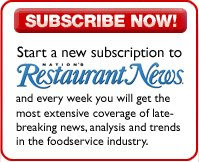 Jeremy told me he’s going to be involved in that restaurant as well as in Plum, and also in future Patterson ventures. I asked if he was Patterson’s corporate chef, then. 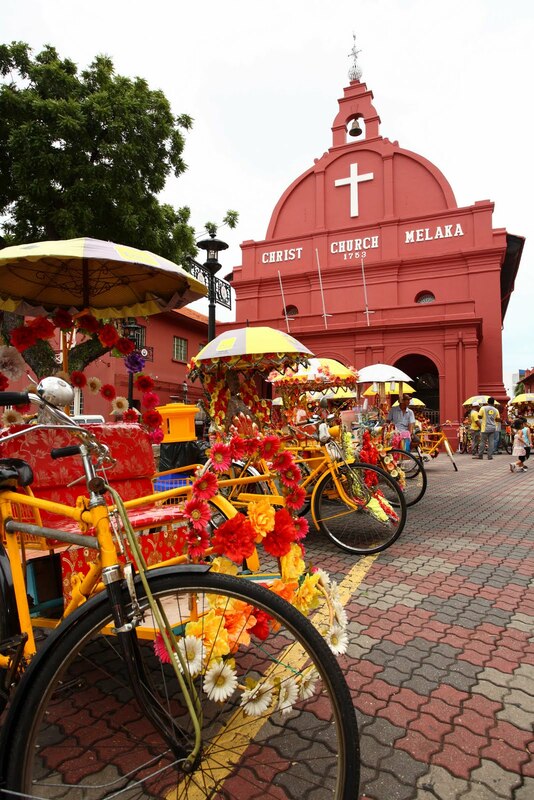 Malacca’s a very touristy city. That in itself is not surprising. It’s an old port settled first by a rebel Malay prince of the maritime empire of Srivijaya, whose capital, it is believed, was near the modern-day city of Palembang, on Sumatra. Then the Portuguese took it over, then the Dutch, who traded it to the British for Aceh, the northernmost province on Sumatra (and the epicenter, as you may recall, of that terrible tsunami in 2004). So it has cool architecture and old forts turned into museums and, on top of that, is an important center for Peranakan culture and Nyonya cuisine. Why wouldn’t it be touristy? What I found interesting was that most of the tourists we saw were Malaysians. 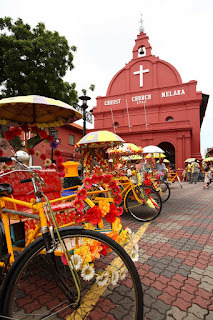 But we didn’t take a day-trip to Malacca to see its historic sites (although we did a bit of that; you might as well while you’re there). 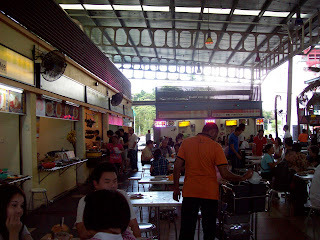 We were there to eat Nyonya food. See? 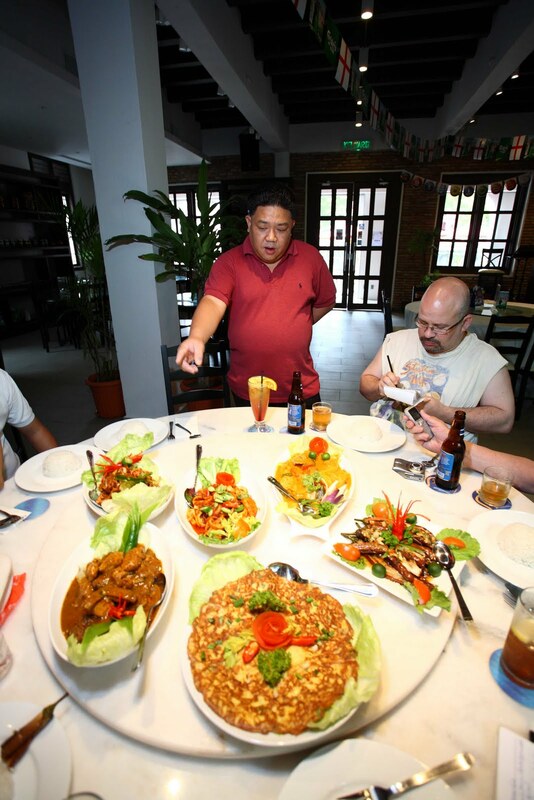 That’s me, on the right, taking notes as Alvin, the owner of Taragon restaurant, explained what I was about to eat. See how serious a note-taker I am? I was, as always, glad that Albert Foo was there to take the pictures. 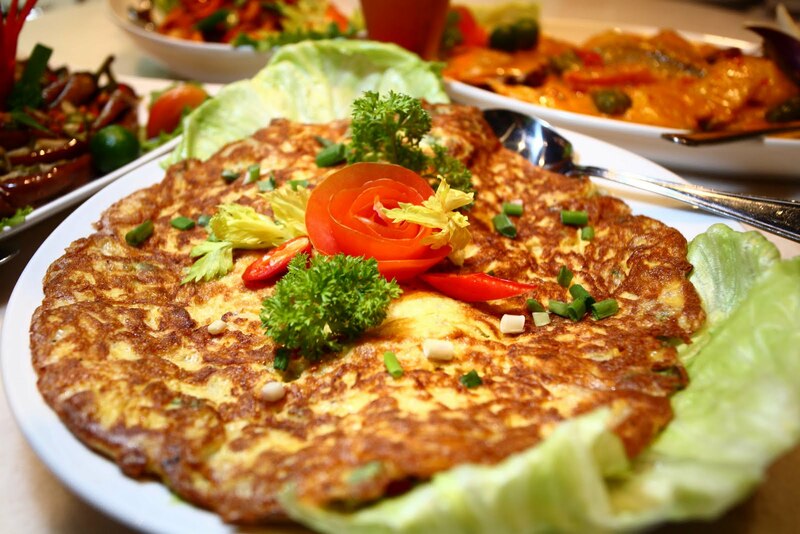 Usually in the United States we refer to the food of the Straits Chinese as Nyonya cuisine. Actually, we don’t usually refer to the Straits Chinese at all, as Malaysia is noticeably absent from our country’s radar. We don’t know a thing about the place. But you know what I mean. In Malaysia I’ve usually heard it referred to as Baba-Nyonya, which is really more illustrative. As I understand it, “Baba” is Chinese for father, while “Nyonya” is Malay for mother, or “madam” — the female head of the house. You see, single Chinese men came to the Malay Peninsula centuries ago to work in the tin mines. They married Malay women and tried to instruct them how to cook food they were accustomed to. But the Malay women had their own ideas, and as a matter of course added their own culinary flourishes to the food. The result was dishes like the sambal-petai squid you see as the first picture of food in this blog entry. 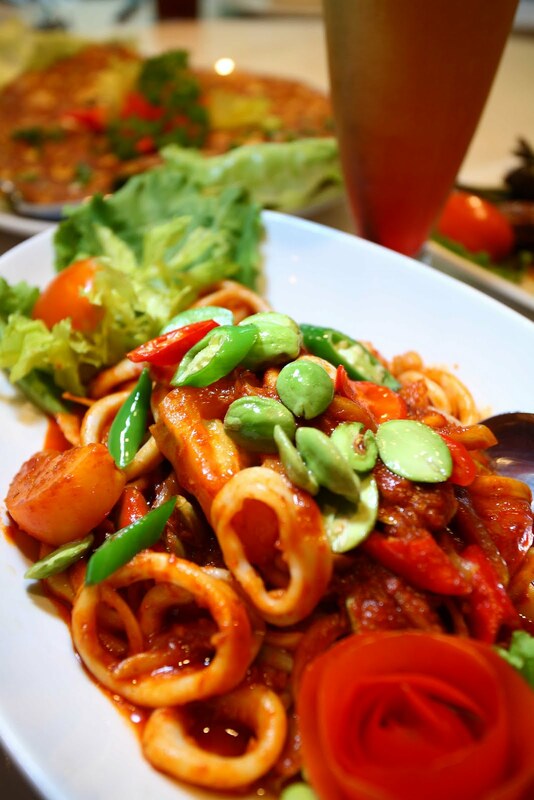 It’s stir-fried squid — something Chinese would make, but it’s flavored with Malay sambal, the local chile sauce, often spiked with shrimp paste called belacan (pronounced bla-chan), and a, oh, let’s call it aromatic, bean called petai, known for its bitter taste and ability to linger on the breath. 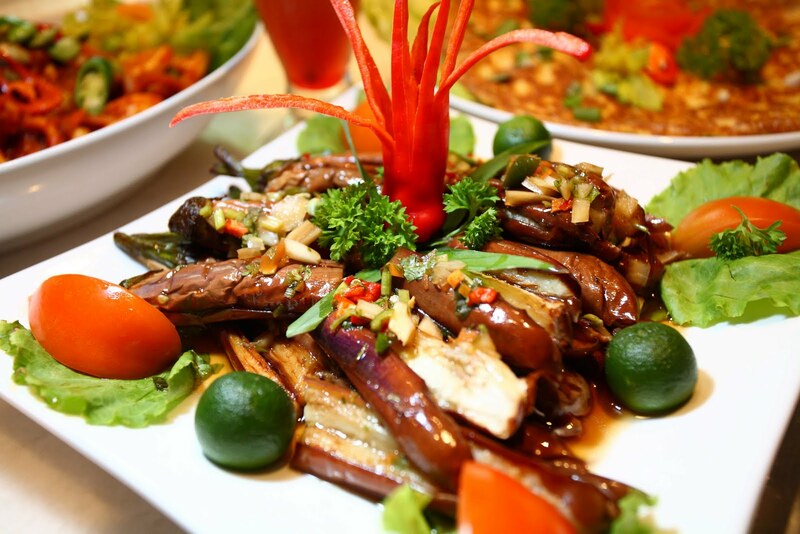 Next is terung bakar, or eggplant, served with chiles and a soy-sauce based gravy. 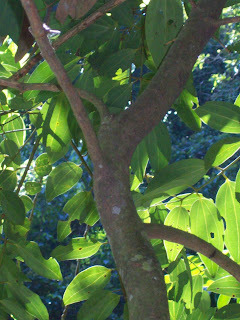 Notice also the tiny limes that flourish in this part of the world. Next, well, that’s actually just a Malay dish — beef rendang. It’s a sort of curry made — as curries generally are — by heating chiles and other spices in oil, and adding liquid to that. Rendang has coconut milk added to it, and is generally cooked down until most of the liquid has evaporated, although like all national dishes it kind of depends on who you talk to. Alvin told us that at Taragon they make the rendang a day in advance to make it taste better, as stews tend to do as their flavors meld. We also had a cincalok omelet. Cincalok (pronounced cheen-cha-loke) is very much like belacan, except it comes from Malacca. 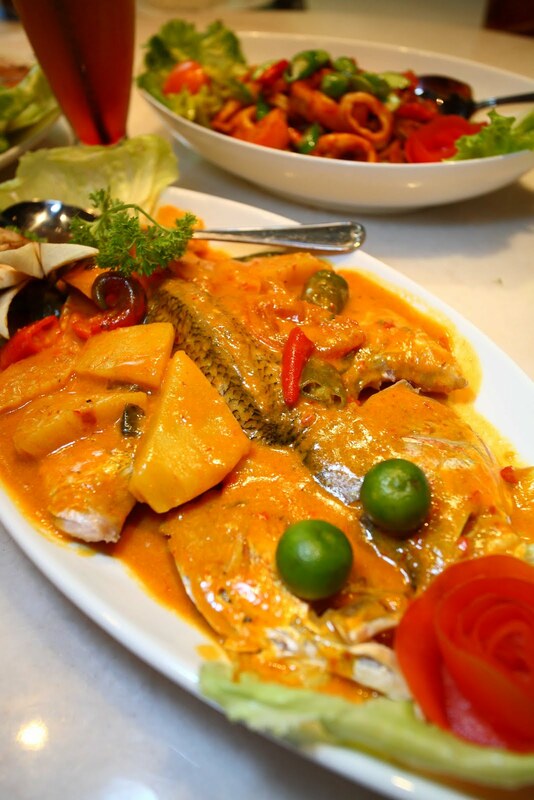 The last picture is of lemak nenas, a ginger-laden fish cooked with coconut sauce and pineapple. On your left, please enjoy a beautiful picture by Albert Foo, the kind man and extraordinary photographer who accompanied us on Penang and has rejoined us here in Malaysia’s capital, Kuala Lumpur. He actually took that picture at the Shangri-La Rasa Sayang in Penang, and once I get his shots from last night I’ll replace it, or possibly just add it below for the sake of contrast, because this picture would not be approved by Matrade. Malaysia’s export-promotion body takes its satay seriously, you see, and this satay is displayed incorrectly. 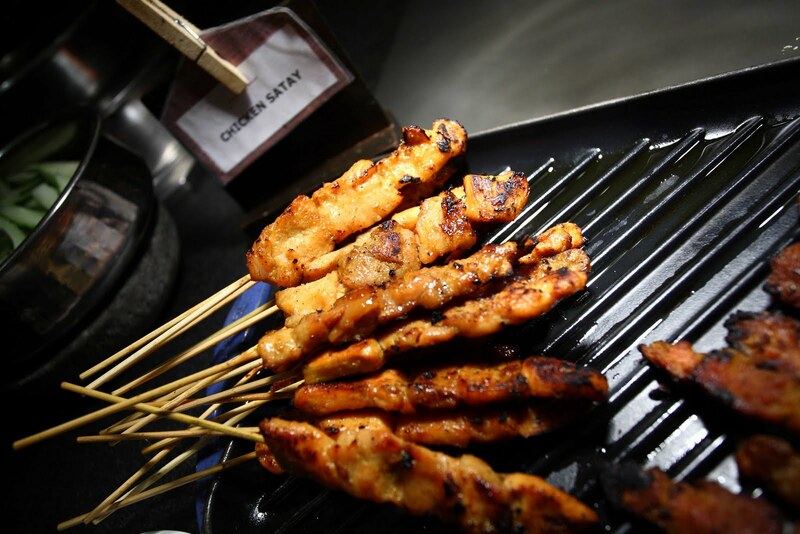 Satay is not just a bunch of skewers of meat, it’s a meal. Like the one on the right, in the picture taken, of course, by the inimitable Albert Foo. Incidentally, it’s also not Thai, any more than tacos are American. You can get satay in Thailand, but they’ll tell you flat out that it’s Malay. Whether it’s Malaysian Malay or Indonesian Malay is open to debate, but everyone agrees, more or less, that satay was invented by the people of the Malay archipelago. Honey Ahmad, chief content creator and co-founder of friedchilies.com, who accompanied us last night to a restaurant called Satay Station, says the term might be an abbreviation of salai di tepat. Salai is the Malay word for barbecue, and a tepat is a makeshift grill. But as I was saying, satay is more involved than that. To be called satay by Malaysian standards, it must be served with pickled cucumber [see comment #1 below] and onion as well as peanut sauce. And it must also come with rice. Ideally, satay is served with nasi ketupat, which is made by pouring uncooked rice into a sort of stiff pouch made by weaving coconut leaves together. That’s put in boiling water, and as the rice cooks it expands and is compressed into one solid piece of rice, which is then sliced and eaten with the satay (and also dipped in peanut sauce if you like). If you don’t have nasi ketupat (and Satay Station doesn’t have it) nasi himpit, which is boiled white rice pressed together into one solid piece, will do. 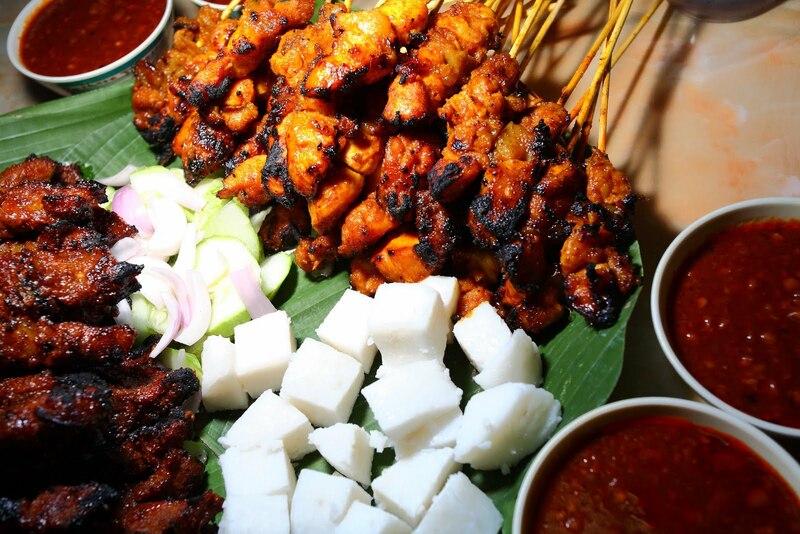 A Matrade-sanctioned picture of satay must have the skewered meat, cucumbers, onions and rice in it. Honey explained that satay is made by pounding together fresh turmeric, sugar, onion (or shallot — usually shallot) and lemon grass and marinating cubed meat in it — any meat, including liver or tripe or whatever you like — for about a day. Then you skewer it and cook it over coals, being sure to let some of it caramelize. We had chicken, beef and chicken liver satay, with a really sweet peanut sauce with coconut milk in it. The beef had little bits of fat skewered on it, too, and the chicken had pieces of fatty skin. It was preceded by mee rebus, which you can see on the left (in a picture by Albert Foo) made in the style of Johor state, I’m told. That’s yellow noodles, green chile and seafood broth with potatoes, sweet potatoes, boiled eggs and fried shallot. This dish might not look particularly appetizing, but blame that on my photography, not on the food. 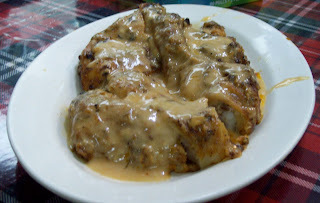 It’s ayam percik (pronounced perchik), one of the specialties of the Malaysian state of Kelantan, in the country’s northeast. It’s charcoal-grilled chicken topped with a coconut milk sauce. 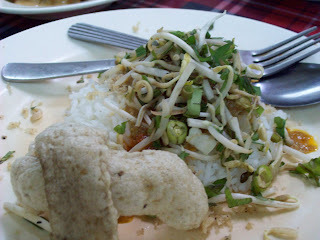 It is typically served with nasi kerabu, which is rice topped with herbs and other nutritious green things, plus bean sprouts. And two nights ago, when I took this picture, it also was served with shrimp crackers. You can see a picture of it on the right. Ayam percik and nasi kerabu are delicious together, they really are, and I think they’d translate well to a western state of mind. We also had them with clams cooked in sambal (what’s not to like about that?) and peppers stuffed with fish paste and served with salted, hard-boiled eggs that were sliced in half and served still in their shells. I suspect going to Kelantan was my doing: As this trip was being planned I mentioned to one of the organizers that I’d had the best mangoes in my life in this state’s capital, Kota Bahru. Next thing I knew it was on our agenda. Apparently I had given entrée to Wan Norma Wan Daud, director of the Product Section of the Product & Services Development Division of the Malaysia External Trade Development Corporation, or Matrade. Matrade sponsored this trip, and Norma is a native of Kelantan. We had a good time there. Kelantan, I’m told, is quite distinct from other parts of Malaysia. It’s the most Muslim of the 13 states, but also displays strong influence from its neighbor to the north, mostly Buddhist Thailand, a country of which it was once a part. The part of Thailand that shares a border with Kelantan is actually mostly Muslim, but the Malaysian state still has a number of Buddhist temples and monasteries, and it shares some words and eating habits with Thailand, too. The Kelantanese expressed pride in their elaborate wau (pronounced “wow,” which, in a perfect world, is also how it would be spelled). It’s a word for kite they share with the Thais. They also share a love for funky, fishy flavors, such as budu, made from fermented and, to my taste, slightly rotten, anchovies. That was served to us during lunch yesterday, they day after our dinner of ayam percik and its traditional accompaniments. Kelantan was unseasonably, unreasonably, inhumanely hot yesterday and, cognizant of the fact that I was in a serious Muslim state, I chose to forego shorts and wear long pants instead. Thus did I swelter with my fellow westerners as we were led through the market, breakfasting on a hot soup of laksam — sort of like boiled rice gnocchi — and looking at the region’s signature blue rice, dyed from a flower we haven’t yet identified, and at silks [June 16 update: the flower, according to my new friend Krista, is bunga telang; she hasn’t lied to me yet]. I had Paco buy some mangosteens — a fruit I’ll discuss later, along with the salak that we’d found the night before — before we went off to look at how serunding and dodol were made. Remember, it’s easily 90 degrees out. And humid. Feel your scalp as the sweat pools there and then trickles behind your ears and down your neck and back as I explain that serunding is shredded meat made by stewing beef or chicken in massive vats of a rendang-type curry for a couple of hours, until the meat falls apart into strings. We stood over hot cauldrons watching this happen, and saw the meat in other cauldrons being further dried out over huge flames. Remember that heat as we moved on to watch the production of dodol, a type of caramel made of palm sugar and coconut milk that are slowly cooked together, again in big, bubbling cauldrons. Dodol’s interesting, because coconut milk has a gelatinous quality that becomes evident as it solidifies; dodol has a softer, gummier, less chewy and more tender texture than a western caramel. It’s frequently flavored with pandan, although Paco gave me one with durian, which he has decided is my new favorite flavor (it’s not; I like it now, but I like pandan, too). It was all quite interesting, as was seeing the coconut-milk snacks made by pouring coconut milk mixed with flour and eggs into cast iron molds over smoldering fires, covered with coconut husks to give them a bit of extra smoky coconut essence. But did I mention how hot it was? We didn’t have much of an appetite for lunch, which was another traditional Kelantanese meal called nasi ulam kampung (rice and village greens, I believe). Here’s how they both work: You start with rice in the middle of your plate, and you add to it, one bite at a time from an array of dishes in the center of the table, any of a wide variety of greens and a dab of chile sauce (nam phrik in Thailand, sambal in Malaysia), augmented occasionally by a bit of meat or fish. Our nasi ulam kampung also had a tasty roast chicken, fried fish and a couple of different fish curries, plus that fermented/rotten fish called budu that I was telling you about. I told Paco that budu was one of those tastes that are not easily accessible to Westerners, and he said that lots of Malays don’t like it either, “including this one,” he said. But A’dzimah showed me how to eat it. Both A’dzimah and Paco are from near Kuala Lumpur, but A’dzimah married a man from Trengganu, the next state over from Kelantan, which shares an appreciation for budu. The key, she basically explained, is not to eat very much of it. You mash some chile up in it, then get a bit of fish and a vegetable, and eat it all together. I agree that if you have to eat fermented fish, maybe because, I don’t know, no other food is available or something, it’s a pretty good way to do it. Along with various faintly aromatic greens that looked like weeds, we also had green jackfruit, which has a texture very much like artichoke hearts, and a vegetable that looks like a gigantic pea pod, maybe from the Cretaceous era. I knew it from Thailand as satoh, but Paco just called it “stinky bean,” probably because of its tendency to linger on the breath. I’ve always kind of liked its weird nuttiness. I later learned its Malay name: petai. We all agreed the chicken was terrific. Paco, good Muslim that he is, bowed out of dinner last night, which was destined to be laden with pork, and instead we were treated to the company of Helen Ong (pictured with restaurateur Ong Shin Hong), a charming Peranakan woman who just finished writing her second edition of the book Great Dining in Penang. Peranakan is a Malay word indicating a mixed-race heritage, but it refers specifically to Straits Chinese, the Chinese people who started settling here on the Malay Peninsula (mostly), starting in the 16th Century. Initially they were men, who naturally married Malay women, and a new culture was born. 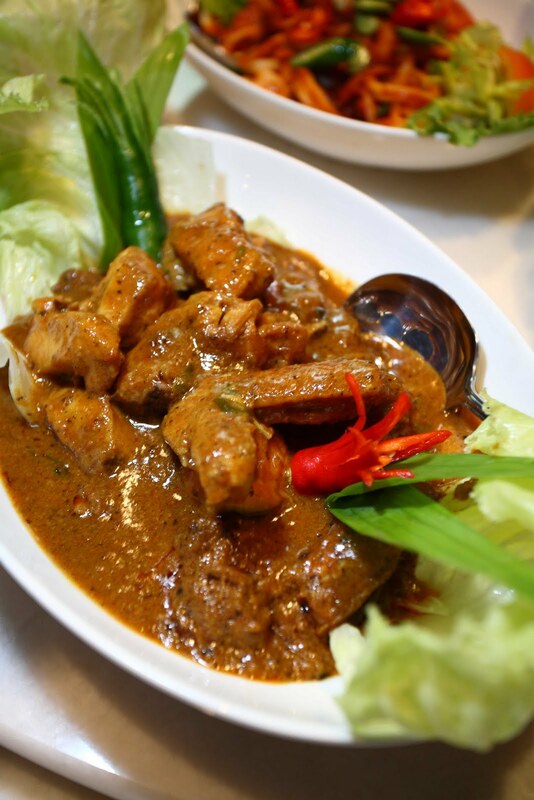 Their cuisine is often called Nyonya, or Baba-Nyonya, the titles of the woman, or man and woman, of the house. The bulk of Peranakans originally came from Fujian province. Fujian’s actually the Mandarin name for the province. In Fujian dialect it's called Hokkien. The Hokkien worked hard and prospered, and as Malaya came under British rule, they began to adopt the characteristics of their new overlords, wearing top hats and suits and walking with canes. “Even furs,” Helen told us, with an expression of disbelief and disdain very much in the style of a posh English person. Remember, Malaysia’s a tropical country. Fur coats would be uncomfortable. Helen explained the Peranakans to us as she ordered dinner at Shing Kheang Aun, a restaurant that opened its doors in 1941, serving Hainanese food. You see, Helen explained, in the late 1800s, the Malay Peninsula experienced a huge migration of Chinese laborers from Hainan, a large island to the southwest of China’s Guangdong province (whence come the Cantonese, and, incidentally, the Teo Chiew, but they are not part of this story). For the sake of accuracy, I’ll point out that Hainan itself has for much of its history been part of Guangdong. The Hainanese came to be known for their culinary skills and were hired by the British as cooks. The Peranakans, mimicking the British as they were wont to do, hired the Hainanese, too. So the Hainanese learned to cook both British and Peranakan food, but also retained their own culinary culture. 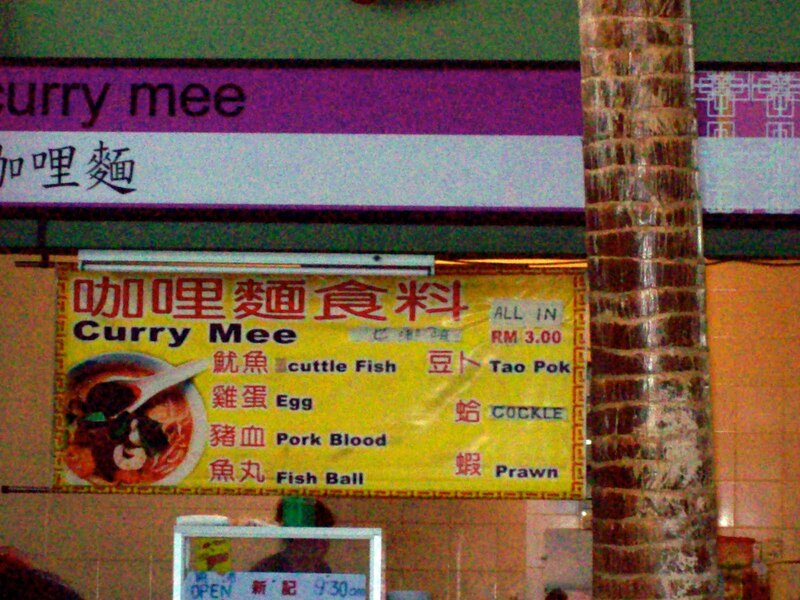 That, Helen said, is the “Hainan” cuisine of modern-day Malaysia. At any rate, Joanna, Bob and I thought the food was fantastic. Helen, local restaurant critic and anglicized socialite that she is, was more critical. She disagreed with the sambal belacan, which according to Peranakan custom should be made from shrimp paste, fresh chile, salt and sugar, and that’s it. “That’s the Peranakan way,” she said. Thais add garlic and fish sauce, she said, which is equally delicious, but not Peranakan (she pointed out, by the way, that Peranakans are not just in Singapore, Malacca and Penang, the cities for which they are known, but also on the Thai island of Phuket, and Medan, a large city in northern Sumatra, just across the Strait of Malacca, and there are some on Malaysia’s east coast, too). She also said her assam tumis was better than Shing Kheang Aun’s. I have no reason to doubt her, but I thought the restaurant’s assam tumis was terrific. Assam is the Malay word for “sour,” and tumis means “fry.” It refers to the sour paste that’s fried to make the sauce for this fish curry, which tasted very much like southern Thai gaeng som, which means “sour curry,” and is made with garlic, chile and fresh turmeric fried together to make a curry base. Assam tumis also has tamarind in it, and I have no doubt that some versions of gaeng som do, too. 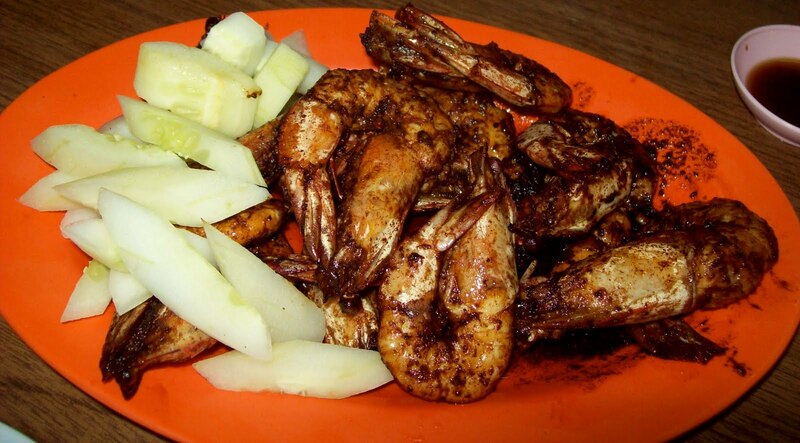 It was my favorite dish, but Joanna and Bob really loved the shrimp, which was marinated in tamarind, salt and sugar and then fried (it’s pictured on the right, unlike the assam tumis, which is not as photogenic). We also had beef liver and pork fried with soy sauce, stir-fried bean sprouts flavored with salted fish (which reminded me once again how ridiculous it is to eat bean sprouts raw — a state in which they’re disgusting), salted vegetables flavored with pig trotters, and Hainan-style noodles (apparently it is not the Hainanese custom to add black soy sauce to their noodles). As dinner wound down Helen explained the origins of the name Fatty Crab, a chain restaurant in Kuala Lumpur after which Zak Pelaccio’s New York restaurant is named. Transliterated into Roman letters as Fei Hai, it could mean either one. If you’re Cantonese and see a sign written that way, it’s funny. It’s kind of like the California-based chain Pink Taco. When we left off, I was headed to a cooking demon-stration. On your left is a picture of that demon-stration. 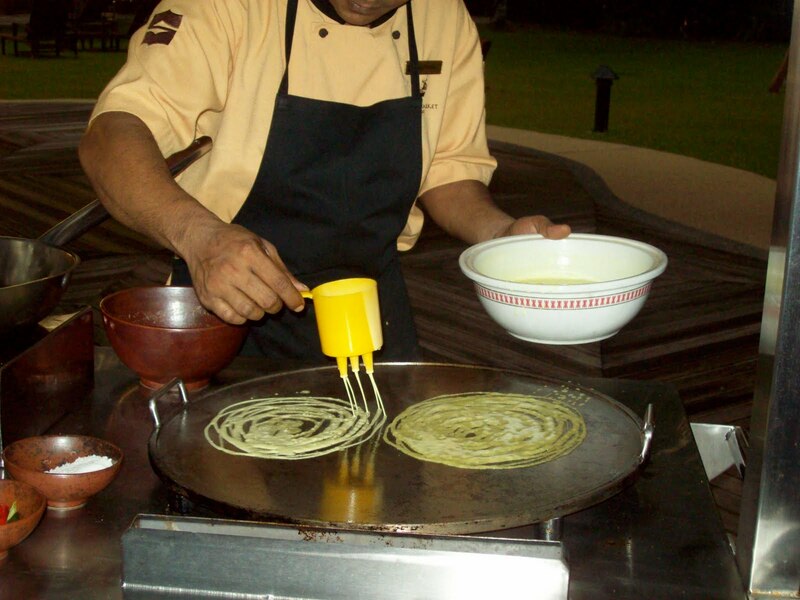 One of the chefs here at the Shangri-La showed us how to make roti jala. Roti is a griddled flatbread. Jala means “net,” and you can see why. The batter is poured out onto a griddle using a special cup with holes poked in it. You have to fill in the center of when drizzling the batter onto the griddle, but the outside is meant to be light, thin and a bit lacy. Then you fold the sides in and roll it up into a little spring-roll shaped package. Joanna and I took turns at it, and then Paco, our head tour-guide and an avid amateur cook, showed us how it’s done — the key being rotation of the wrist. I forget why. The result looks sort of like a crêpe, but the texture’s more spongy, reminding me a bit of Ethiopian injera, actually. The chef also showed us how to make a chicken curry, and then we went inside and had dinner at Spice Market, a giant buffet restaurant with foods from Peninsular Malaysia’s three main cultures, as well as Japanese and Western food. We were joined by lovely and charming local journalist CK Lam, and her camera-bearing husband whose name I didn’t catch. Nice guy, though. I learned long ago that buffets are not to be conquered. You simply can’t try everything there, so you must narrow your focus. Inspired by our cooking demonstration, I settled on Indian food and helped myself to beef and fish curry. I was glad I’d been relatively abstemious, because then we were brought out roti jala and chicken. And then, just for the heck of it, they brought out beef rendang and passembur. The former is a rich beef curry and sort of Malaysia’s national dish (although I think the comfort food of choice is a fish-and-rice job called nasi lemak, which I haven't had on this trip yet but probably will soon). Passembur is an assortment of fried things, hard boiled egg and shredded cucumber eaten with a peanut sauce. We spent today at the Penang Spice Garden, which specializes in spice-related plants, like this cinnamon tree pictured on the right. After a quick tour, focused for some reason on spices’ homeopathic qualities, we took a cooking class with Nazlina Hussin, who had me straddling a wooden box with a circular piece of serrated metal sticking out of it. That’s used to grate coconut, which I did. She also taught me how to crack open a coconut: The fruit has a trio of black spots, two of which are indented. The other protrudes a little bit. Hold the coconut with your thumb on the protruding bit and hit the thing on top with a hammer. If you give it an adequate whack it will split, so hold it over a receptacle to catch the coconut water, which is a very trendy drink these days, because it has electrolytes and is supposed to cure every ailment and probably will help you sing better, and fly, too. Continue hammering around the side of the coconut to open it all the way. Then Nazlina put me in front of a batu giling, which is the Malay version of a metate — a flat stone and a big stone rolling pin — and I spent the next hour or so smashing garlic, shallot and dried, rehydrated red chiles into a paste. It was fun, actually, and quite therapeutic, and it gave us all a chance to chat. Unfortunately, I didn’t take any pictures because I was busy making a curry paste, but Albert Foo, our accompanying photographer, was busy at work, and I’ll have many great pictures from him to share shortly. From there we went to a section of covered hawker stalls, because we all agreed that that would be more useful for our mission than to visit the temple that was scheduled for that time. We’d gorged ourselves on Nazlina’s beef with black sauce and a vegetable curry called dalcha, and the plan wasn’t to eat, but I thought I’d better try some curried noodles, which I ordered and then learned that the service style at these hawker stalls was fast-casual. I ordered the food and it was brought back to our table. Joanna had taken Albert with her to explore more of the food stalls, and after I’d finished my curried noodles she returned with clay pot bee tai bok, a very rich dish of short, fat rice noodles that looked like worms, and was rich and soy-saucy and really spectacular. And Paco brought us a light, fish-based laksa because, well, if you’re at a bunch of hawker stalls in Malaysia you should have some laksa. 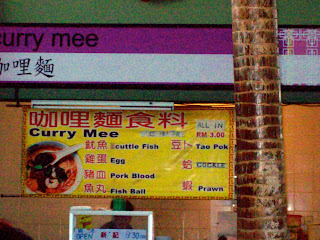 My curry mee had been plain, not with pork blood, but I did want to let you know that that was an option. That picture on the left, friends, is of durian. I should have posed the fruit next to something so you could see just how big a durian is. Each one of those bad boys is about the size of a human head. I’m on Penang, an island in the Strait of Malacca just off the coast of the Malay Peninsula, and it’s my first day of a press trip to Malaysia, where my job is to eat the food and eventually write about it. It is not a hardship posting. This is my first time back in Southeast Asia since I left Thailand in 1997, after having lived there for five years. Malaysia’s not Thailand, but this is my third or fourth time in this country — and at least my third time to Penang — so it feels like something of a homecoming. Living in the tropics made me into something of a fruit snob, and I’m eager to rejuvenate my soul a bit by gorging on the stuff while I’m here. This morning before breakfast I availed myself of the basket of fruit in my room and ate a mango, and then at breakfast I had some pineapple and papaya and dragonfruit (either dragonfruit has no flavor or I haven't had a good one yet). To be honest, durian wasn’t high on my list as something to try again. It’s a famously malodorous fruit — banned in many hotels and airplanes — with a fragrance similar to sulfurous, rotting sewage. People say durian smells like hell but tastes like heaven, but that hadn’t been my experience. I’d had it twice before, once in Thailand and once in Cambodia, and both times it had the agreeable texture of a really good avocado, but it tasted like a toned down version of what it smelled like, only sweeter. Like sweet rotten sulfur. Honestly, as bad as that sounds I didn’t hate it the way many people do, but given all the things you can put in your mouth, why invite durian in there? But people I know who truly love durian — New York Malaysiaphile chef Zak Pelaccio among them — learned to do so in Malaysia. My friend Thomas Fuller, a great guy and durian lover who was based in Malaysia’s capital, Kuala Lumpur, for awhile while working for the International Herald Tribune, said that Malaysians have a saying about Thai durian — that it’s like the Thai people, universally sweet and all the same. That’s not a very nice thing to say, but I wanted to find out what all the fuss was about. 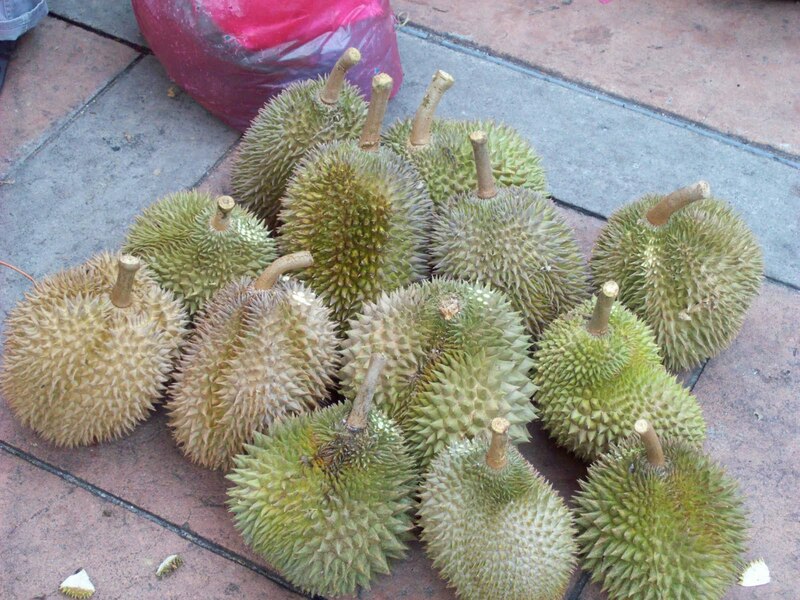 Was Malaysian durian really that great? Right now just happens to be the height of durian season. So this morning, after a second breakfast of charcoal-grilled bread that we dipped in dahl and fish curry, plus coddled eggs with soy sauce and white pepper, all eaten at a Mamak food stall — that’s a stall run by Indian Muslims — when we walked to a nearby open-air market, we tried the durian. And it was better than any durian I’d had before. Absolutely it was. Sweet and rich, aromatic and deeply satisfying. In many ways it was like a raw scallop, something that I also love, in that as much as I enjoyed it, a few bites was enough. So I gave the rest to one of our guides, A'dzimah Ahmad Ghazali, a nice Malay woman who had told me she could eat three whole durians in one sitting. Durian out of the way, I insisted that my fellow travelers — the power food writing couple of Bob Lape and Joanna Pruess — have some longgong. That’s longgong, on the right, in front of the Coca-Cola Light can. I just took that picture in my room here at the luxurious Shangri-La Rasa Sayang. When I refer to longgong, people who think they know all about tropical fruit but don’t often correct me and tell me it’s pronounced longan. Longan’s different. 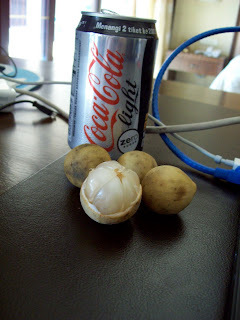 A longan’s sort of a soulless brown shadow of a lychee. Longgong has a smoother, drier texture than a longan and a bright acidity reminiscent of citrus. It has a flavor not unlike grapefruit, but with a somewhat floral bass note. It’s awesome, not like a stupid, boring longan. We went on to sample some pickled fruit, including papaya, mango and salak (also called snake fruit, I’ll get back to that if I ever see a fresh one because they’re great in a weird, sort of off-putting way). After that we had a first lunch of Hokkien dim sum and then toured the mansion of Cheong Fatt Tze, I think to let the food go down before our second lunch, at an Indian place called Ananda Bawan. Malaysia is an ethnic hodgepodge, but the three biggest groups (at least on the Malay peninsula; it’s different in the two Malaysian states on Borneo) are Malays, Chinese (mostly Hokkien, but with plenty of Hainanese, Teo Chiew, Hakka and Cantonese), and Indians, mostly Tamils. That’s a big part of the official, government-mandated Malaysian Zeitgeist, their cultural plurality. I think that’s part of the basis of their insult of Thais and their durians — Thais are all Thais, and thus implicitly boring. Of course, that’s patently false. About a third of the Thai population is Lao, ethnic Malays live in the southern provinces. The north (which also has an array of hill tribes) and west of the country have Shan and Mon people, and there’s a very healthy scattering of Chinese people thoughout the country, particularly in Bangkok and the South. I used to think the durian insult was more grave than that — that it was meant to imply that Thais were shallow, insipid and boring, just like their durians — but today I’m under the impression that the intention is less deep than that. Anyway, since we’d had Chinese food for first lunch, for second lunch, we naturally had Tamil food. We had a classic banana leaf lunch, with curries and dahl and rasam and roasted chicken all served with rice on a banana leaf, which is to be eaten with your hands (or, more properly, your hand — the right one, which is used to conduct public business, while the left one is for more private activities. From there we toured a Thai Buddhist temple and a Burmese Buddhist temple across the street from that and then went on a mission to get Bob a new recording device, as the one he brought with him was misbehaving. Penang is actually an important center for assembly of electronic equipment, and it’s also quite wealthy, meaning electronic recording devices are easily found at any shopping mall. So we went to the Guerney shopping mall and wandered around while Bob went to the Sony center. The shopping mall, as malls are, was a great place for people watching, and there really was a great ease with which the Chinese, Malays and Indians all seemed to interact together. It reminded me very much of Brooklyn, actually. The Chinese make up the majority of Penang’s population, but the country as a whole is mostly Malay. That means they’re Muslim. Although they’re fairly mellow Muslims, politically Malaysia likes to project itself as a leader of the Muslim world, and when it comes to issues such as Israel it tends to align itself with countries such as Syria. So I was delighted to see quite risqué displays in the shopping center. I was so delighted, in fact, that I thought I’d display a picture of one, which you can see above on the right. From there we went back to the hotel to recover from the heat and rest in advance of our cooking demonstration tonight. But I decided to update my blog instead. 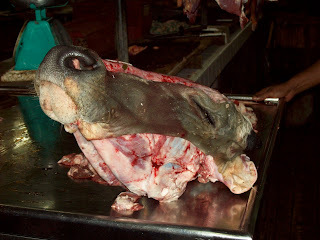 And I will finish this entry with a picture from the market of a cow’s head. 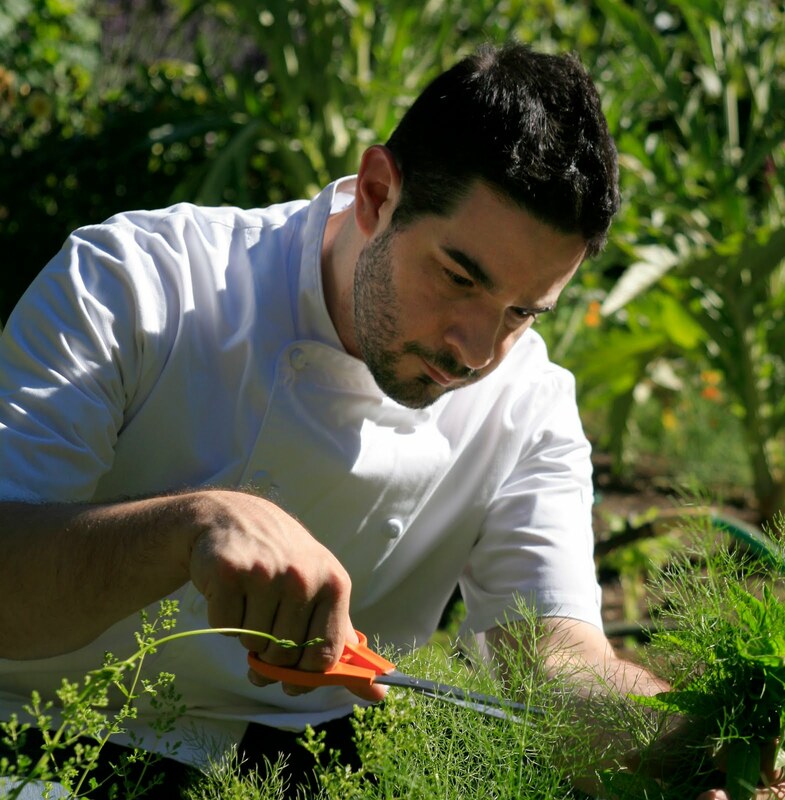 New York, say hello to Keith Kornfeld, the new chef at Pranna. Keith, a New Orleans native, comes fresh off of a stage at Namh, a Michelin-starred Thai restaurant in London, where he studied under renowned Thai chef David Thompson (Thompson's actually Australian, but he is perhaps the world's greatest chef of Thai cuisine nonetheless — at least that's his reputation, I've never eaten his food myself, but I met him at the Beard awards a few years back and he seemed like a nice guy). Before his ten-day stint at Namh, Keith was chef of The Outrigger on the Lagoon in Fiji, and he also has worked in both Bangkok and Phuket in Thailand. Keith has high aspirations for Pranna, which is good, both because Pranna's owners have high aspirations for it and because this city could use some more good Southeast Asian food (although last week my friend Andy Battaglia and I did have some top-notch food at Betel -- of course they knew I was a food writer and that obviously could color the experience, as you know). Pranna's a bit hamstrung when it comes to culinary aspirations by the fact that it looks and feels like a club. 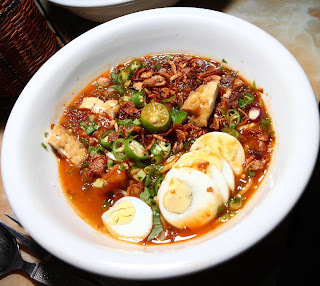 Are its guests looking for great Southeast Asian and South Asian food? Would they know it if they saw it? Is it condescending of me to ask (of course it is, but that doesn't mean I'm wrong)? You might recall that back in February I met the restaurant's bar manager, Eric Greczel, who shared his plans to turn Pranna's basement into a high-end cocktail bar. I've been a bad journalist and haven't followed up to see if those plans came about. If you have, well, why don't you tell me about it by commenting below? In the meantime, best of luck to Keith Kornfeld and the whole Pranna team. (Keith is not, by the way, related to my cousins, the Wichita-Denver Kornfelds, in case you were wondering).